It is all about the power of thought on light and sound, or how to make the invisible visible and the inaudible audible. Claudia Robles-Angel’ Web-Mindscape allows us to have an impact on her exhibition, whether we’re present or not. Claudia Robles-Angel is a Colombian born digital artist working in the intersection of visual & sound art, science and technology. Robles has dozens of acclaimed exhibitions in her portfolio, recently opened her Web-Mindscapes in Germany, in St. Gertrud church in Cologne (Germany). 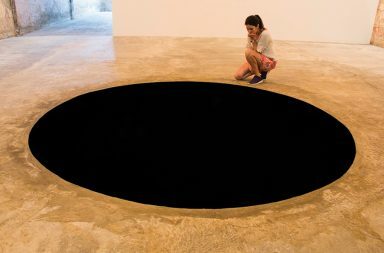 “My practice is inspired by the purpose of how to make visible the invisible or audible the inaudible”, Claudia says. 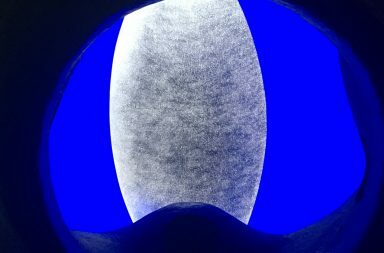 Hence both visuals and sound in her installations are the manifestations of internal and imperceptible body/mind manifestations. Web Mindscape is an interactive and participatory audiovisual setting. The space as such consists of a network of light strings. Visitors interact with an EEG, i.e. electroencephalogram interface, while a computer measures and analyses brainwaves as responses to messages on Twitter. 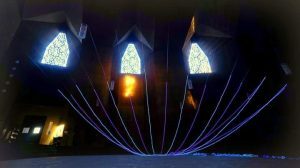 Web-Mindscapes in St. Gertrud church in Cologne (Germany). Anyone can participate in the process from anywhere by tweeting and thus affecting the outcome, the responsive entangled web of light and sound. When subjects are in a stress state, whispers increase, creating a chaotic sound ambiance. The whispers originate from the tweets people send to the installation. 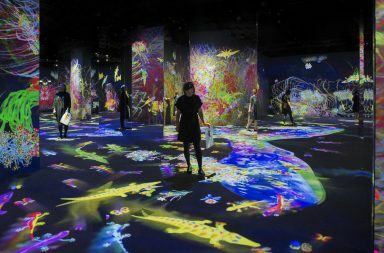 The artist concludes that she uses interactivity to make it possible for visitors to be part of the work, transforming the audiovisual environment with their own internal and imperceptible psychological manifestations with their brainwaves. As people seem to interact more with their smartphones than their neighbours, the artist fully understands the sometimes harsh critic pointed at social media as time consumers. “It is consistent with what is happening”, says Robles. With this in mind, the original purpose of Web-Mindscape is to make visual and audible unconscious internal reactions produced in the subject in front of a massive social network such as Twitter. Web-Mindscape was created in 2016 during an artist in residence in Flushing, Netherlands and has toured the Netherlands, Colombia, Greece, France and the US, before now being presented in Germany for the first time. The exhibition is open until next November 18th. Senior Communications Adviser at Aamu Associates (Brussels) and a journalist at the fact-checking service for citizens in social media “Faktabaari” (Finland).